We pre-teens would marvel at the high-tech mood-setting wizardry, which included strobe lights, disco balls and dry ice. Gaggles of teenage girls dressed in rainbow shirts would shuffle by in clumps, holding hands and giggling. Hotshot figure skaters with feathered Farrah hair would scream past, then twirl in circles in the free-skate area of the rink. Depending on the year, we did the Hustle, grooved to “A Fifth of Beethoven” and sang along with “Mickey” at the top of our adolescent lungs. When the terrifying Couples Skate came up, we suddenly found it the perfect time to hide out in the bathroom. We’d limp home six hours later, feet raw, hopped up on Sugar Babies and giddy with momentum -- and ready to roll back and do it all again. OK, count me in -- even if it means I may break a hip. To get us in the skatin' mood, here's a clip from "CHiPs'" roller-disco two-parter. It doesn't get any more '70s than this. 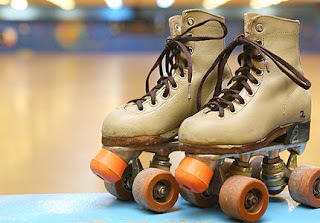 We used to go to the roller rink all the time. It was a great way to hang out all day when the weather wasn't good. On the days we couldn't go we'd skate in my neighbor's basement listening to the same songs from our K-Tel records. "Beth" and "Undercover Angel" were some of our favorites. Here in South Jersey, roller rinks are still around, but their appeal is to younger kids. Most of the rinks that catered to teens and young adults in the '80s have closed. Liability is the usual reason. One rink I fondly remember is now an indoor shooting range -- go figure! Is that Leif Garrett in that video clip? ?